As you can see, the simplest way to label a product is by hand. Cheap and requires no electricity! Works well if you are labeling the occasional package. But if production ramps up, you could look like an episode of I Love Lucy. And that's not even considering if the label goes on straight or even right side up. But there are ways to speed things up. Hand-held label applicators like the Towa APN Series allow you to pre-load a roll of labels and literally wipe them onto your products. A bit faster and, if you have a good eye, you can get them on consistently. Until your arm falls asleep. But for limited production or carton labeling, it works well. Another way to label products semi-automatically is to use a electro-mechanical device which will label an inserted product. For the beverage industry, a simple solution is to use a Bottle-Matic label applicator. This is a machine that you pre-load your labels into and, once set up, will label your round craft beer or wine bottles one at a time. Just lay your bottle on the rollers, hit the button, and a label is dispensed perfectly onto the bottle. Many start-up breweries use these for the first few years of production. But as they grow, they can step up to a more automated labeling systems that will blend right into their bottling line. A label applicator like Weber's Model 121 bottle-wrap system can label bottles as they proceed down a conveyor at up to 30 bottles per minute. It features the fast and accurate positioning of full, overlap and partial-wraps of pressure-sensitive labels on cylindrical containers. Products up to 7" in diameter and up to 12" high easily can be accommodated using the system's adjustable guide rails. For package labeling other than bottles, you would step up to an automatic label applicator like the Weber Alpha Compact. This system connects to your production line and can dispense and apply labels at up to 164 feet per minute. These applicators can be configured in multiple ways so that you can label the top, bottom or sides of products. There are even options that use a tamp-blow application module so that labels can be applied in recessed areas like the lid of clamshell containers. 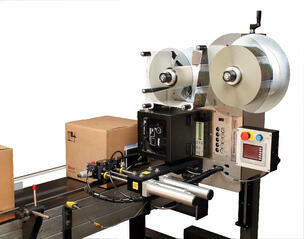 These label applicators use a servo-controlled system that keeps the labeling in sync with the production speeds. It even allows starts and stops without label jams or skips. Product sensors on the conveyor line trigger the label application as they pass by, allowing an extremely accurate label placement of ±0.03 inches. The next progression for speed and complexity would be a system for people who need to print AND apply their labels automatically. Label printer-applicators, like the Weber Model 5300, can print black and white thermal-transfer or direct thermal labels and apply them to passing products on a production line. These print-apply systems use Zebra, Datamax or SATO print engines that are basically the same as the tabletop label printers you use for single labels. Label printer-applicators are more sophisticated than regular label applicators in that they can store various repeated labeling jobs, can be accessed remotely via wireless Internet, and can be configured in a wide variety of applications. The standard tamp-blow print apply system has a tamp applicator that grabs the printed label from the print engine and holds it until the sensor tells it to apply the label. Then the applicator lowers to within 1/4-inch of the product and blows the label onto the surface. This can be done on top or any combination of sides of the package. 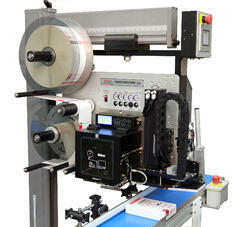 Another popular label printer applicator configuration is a two-sided labeling system like Weber's Model 5300 Twin-Tamp. Based on a regular 5300 Tamp-Blow machine, it has a special arm that allows it to print and apply a label to the front and side of a carton as it travels by on a conveyor. This helps meet certain labeling requirements from large corporations that need identification labels on all four sides of a carton. Another way to handle multi-sided labeling requirements is with a corner-wrap labeling system like Weber's Model 5300 Corner-Wrap. This one uses a longer label (basically two of the same sets of label information on one long label) and after printing the label, wraps it continuously around the corner of a carton. Two of the systems can label all for sides of cartons that go by. RFID labeling - Weber's Model 5300 rfid can print, encode, verify and apply labels all in one operation. Medical device labeling - Weber Model 5300 Split-Tamp can print and apply labels around a corner of a medical device package thus creating a tamper-evident seal. Tire labeling - Weber Model 5300 Tire Labeling System can print and apply extremely adhesive labels to new tires on a production line. Pail & drum labeling - Weber's Model 5300 Pail & Drum label printer applicator can print and apply labels to round containers from 55 gallons drums to small paint cans. And there are options for air-blow label application, pallet labeling and more. There are even economical versions of some of these systems - Weber's Model 4300 Pro-Apply Series. And when you have to print and apply labels, like shipping labels, at high speeds onto packages of varying heights, you would need something like Weber's Model L-A 6000 Variable-Height Label Printer Applicator. Distribution centers, like Amazon, UPS, FedEx and more, process millions of items a day that come in all sizes. You can print and apply address labels quickly with the L-A 6000 because it has built-in sensors that determine the height of the package and stop the applicator 1/4-inch away. It blows on the label and retracts for the next item. It is so fast that it can print and apply up to 40 labels per minute thanks to it's carbon-fiber applicator construction. Accurate and reliable. That's it for our journey from hand application to high-speed automation. There are many more systems out there that might apply to your specific product or process. Your production speeds should tell you which of these types of systems will work best for you. Take into consideration future growth, multiple shifts, downtime and maintenance for a complete picture. If you need more information or have any questions about labeling systems, drop us a line. We can help guide you along the way and avoid paper cuts!